HANDS UP: Manfred Pohlenz, second from left, with castmates inThe Merry Widow. A QUICK scan of the audience while taking bows at a recent Melbourne opera show delighted singer and school music director Manfred Pohlenz. Plenty of familiar faces smiled up at him – his music students from Kardinia International College had travelled the distance to see his show. “The number of faces I could recognise as Kardinia students was fabulous,” Pohlenz recalled. “We have a number of students who are interested enough to hop on a train or go into town with their parents and see a production of opera. Pohlenz said he was looking forward to an enthusiastic response from a Geelong audience at Melbourne Opera’s upcoming production of Franz Lehar’s The Merry Widow. Pohlenz plays Bog Danovich, an aristocratic count integral to the story’s development. The lively operetta has remained a favourite since it swept the world in 1904, with its score featuring Merry Widow Waltz, Girls, Girls, Girls and Vilia. “The story tends to be more timeless than a conventional operetta,” Pohlenz said. The show’s star performers include soprano Dominique Oyston as Hanna Glawari, the merry widow, David Rogers-Smith as Count Danilo, Roy Best as Camille and Geelong-based Lee Abrahmsen as Valencienne. Pohlenz described the show as somewhere between a contemporary musical and a traditional opera in English. The artists would perform the entire production without microphones and with the support of Melbourne Opera Orchestra, he said. Pohlenz said opera singers performed “weird and wonderful” exercises for at least an hour every day to keep their voices in shape. “I’ve found my daily regimen of using my voice properly while teaching actually enhances my singing. My teaching colleagues often look to me to project my voice to talk to a large group of students because I don’t need a microphone,” he laughed. 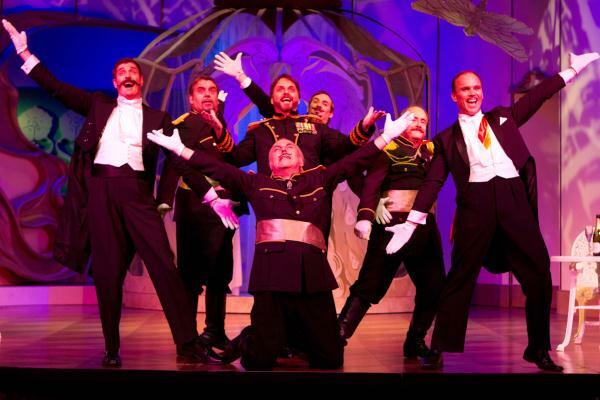 Geelong Performing Arts Centre hosts The Merry Widow on 13 April.